In 2008 a new earpiece was unveiled that is being hailed as a means for stopping stammering. As of March 2008 the device was still on trial in select areas of the United Kingdom and was not yet available on the NHS. For some answers to frequently asked questions about the device, please continue reading. What is the New Earpiece that Helps with Stammering? The new earpiece that helps with stammering is essentially a small electronic device that fits in the wearer's ear. There is more then one brand name for similar designs, however, so it is not possible for the earpiece to go by one generic name. The SpeechEasy implant and the VoiceAmp device are the two most well known types of earpieces at the moment. Defstut and CasaFuturetech are two more types of systems that may help with stammering though they are both require bulkier technology and are not technically earpieces only. How Do the Earpieces Work? The earpieces work by creating a "choral effect" for the wearer that makes the wearer's brain think that two people are speaking at the same time. It does this by playing the wearer's voice back at a higher pitch with just a 60 - 100 millisecond delay (both of these variables can be adjusted on the earpiece). Basically it creates an echo of the wearer's own voice. Why Do the Earpieces Work? The earpiece was designed because it was noticed that many stammerer's feel that their speech condition eases when they sing along, read at the same time or even chant with others. Others say that their stammering eases when they are in an environment, such as at a party or in a crowd, in which many others are speaking at the same time. It was thought that if there was a way for stammerer's to always have the voice of an "other" in their head at the same time that they speak then it might be able to unblock the stammering impediment. Rather than rely on others, however, the device was designed to work with the wearer's own voice so that it wouldn't matter where they were or who was around when it was used. Do the Earpieces Work for Everyone? Like any kind of speech therapy the earpieces will not work for everyone, but it is estimated that it will take about a month for wearer's to realise whether or not an earpiece will help them. For this reason many speech therapists and the British Stammering Association would like the devices to be available on the NHS with a 30 day trial period. How Can I Get An Earpiece? The only options for obtaining an earpiece at the moment are to become involved in a test group or to purchase the earpiece privately. The cheapest option is the Defstut system which retails at around £180, but the earpiece only options cost significantly more - anywhere from approximately £1250 for VoiceAmp to £3050 for SpeechEasy. Some earpieces are available from speech and language therapists and it is recommended that they be obtained in this way as professional support will be useful during the trial period. Where Can I Obtain More Information About An Earpiece? 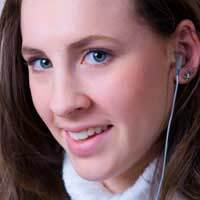 The British Stammering Association (www.stammering.org) is piloting a trial of the VoiceAmp earpiece and will have more information about the device and the future of such earpieces in the United Kingdom. The hearing centre at BMI The Alexandria Hospital (www.alexandriahospital.co.uk) are working with the SpeechEasy earpieces and can be contacted for information specific to these devices. Hello, I pruchased a speecheasy device in 2009 and realised quickly that it was effective only for a short period of time. Since then I only use it when I have crucial meetings and it seems to be effective if used in that manner. Regards. @Neil - there was a five year follow up study in 2010 by Ron Gallop,Loyola University Maryland and Charles M. Runyan, James Madison University and which has no no financial or nonfinancial interest in the organization. You just need to Google: SpeechEasy Reviews American Five Year Follow Up Study.